June 14, 2003: The main curtain of the prestigious Mary Jane Teall Theater of Century II Convention Center (Wichita, Kansas) opened at 7:30 PM sharp. Right after the chanting of the Gayatree mantra, Manick Sorcar’s long-awaited "Synergy" started with a great bang. Fourteen artists filled the stage synchronized with fusion movements, coordinated color-laser graphics and overhead intelligent lighting. Sorcar’s stage production was an extravaganza of laser-animation-dance-drama-magic. 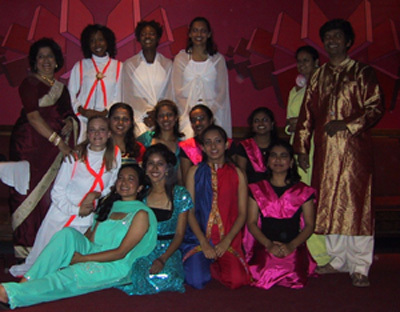 The two-hour program captivated the audience with 19 choreographed by Piya and Payal Sorcar. 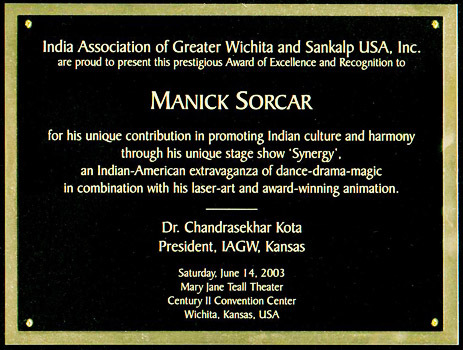 At the end of the show Manick Sorcar was awarded with a recognition plaque by Dr.C. Kota, president of IAGW and the Founding President of Sankalp, Inc., USA. The team was honored with a standing ovation from the cheering crowd. "Hats off to you and your group of talented artists. On behalf of the people of Wichita let me thank you for entertaining us with your unique talents. The feed back I got from the community so far is very positive and full of praise. 'India Forever' - is a masterpiece. You presented four thousand plus years of Indian history and culture in an eight minute segment, in a manner which was never done before. 'Dancing with my soul' - speaks volumes of your talent and expertise in laser technology. No wonder there are only handful of people like you in the world who can present a life size animation. We are proud of our history and culture and on June 14th you made all of us prouder. 'Sad Eyes' - was very touching. Acting talents of Piya are superb. You and your team showed highest level of professionalism throughout. Your dedication and passion for the Indian art and culture is highly commendable. I wish every major town in this country will have the opportunity to enjoy your talent. On behalf of IAGW and Sankalp USA Inc., I wish you and your great team all the success in all your endeavors. With Warmest regards to you and your family." President, IAGW; Founding President Sankalp USA Inc.
"What a fantastic show! We all are very grateful to you for coming to Wichita. Everyone "loved" the show. Our compliments to all members of your group"